This making of this auspicious Yantra is as per the Tantra recommended for the period of Diwali, if that is not possible it can be prepared on any Shubh Muhurat, Tithi, Hindu Festival or any auspicious Astrological Yoga like the Guru Pushya Yoga. The Yantra should be prepared on a Bhojpatra with an Aanar Kalam[pointed stick of a pomegranate tree] and Ashtagandha Paste as the ink. Then the Yantra should be placed in front of you and the Mantra given below should be chanted 108 times using a Rudraksha or Chandana Counting Mala. After this the Yantra should be kept in the Puja Place or any clean place in the house and offered Dhoop-Deep. Thereafter the Yantra should be offered Dhoop-Deep should be offered daily to ensure all round peace and prosperity in your lives. Neelji namaskar, in a lot of your posts one is asked to use bhojpatra to write on. can this now be replaced by paper as i think there was no paper in those days so the bhojpatra was used. also when a certain writing instrument s mentioned like pen made of pomegranate stick etc if on cannot find such an instrument can an ordinary pen be used. isnt it the power of the mantra that works is the vidhi or how to make it that is equally or more important. For this Yantra the prescribed procedure should be followed, read the reply to the comment below. Sir, in reply to one of my queries, once you have explained that there is no difference to bhojpatra and white paper. In this context, I have following queries at s.no. (1) and (2) below. 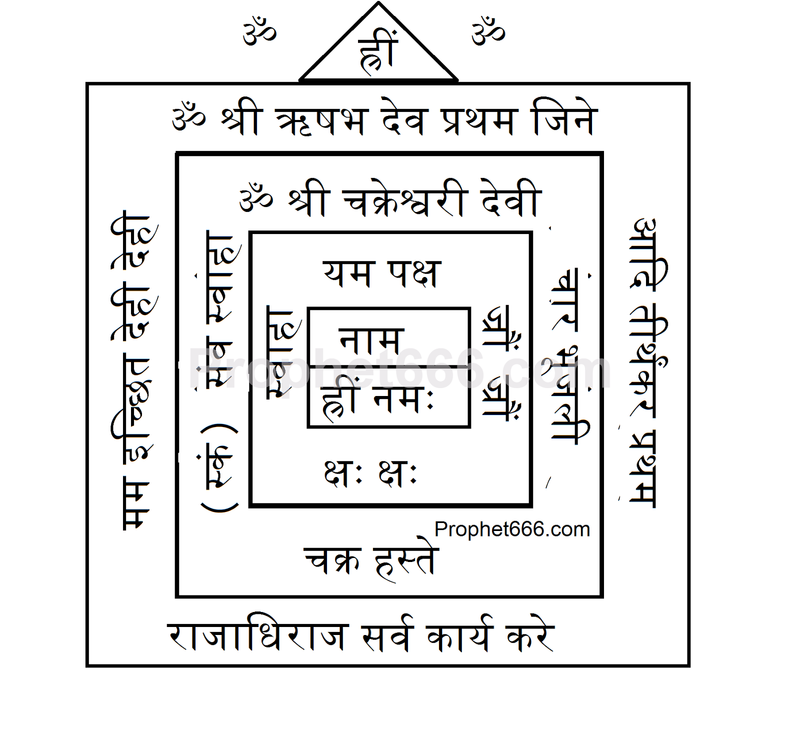 (1) considering the matter on the yantra , big size bhojpatra is required which is not available. So in this situation, can I draw the yantra with red sketch pen on available size bhojpatra? 2) can I use white paper and draw yantra as prescribed ie with anar kalam and requisite ink. 3) in the inner vertical column on both sides, there seems to be certain typographical printing errors as to 'bindis' on certain words ie sav..savaha..chaar..bhujali..
Kindly clear where the actual bindi(s) is/are ? 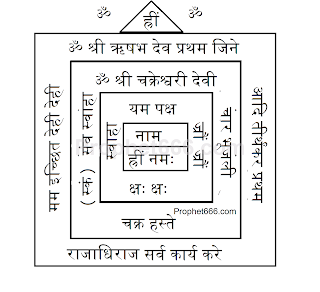 This is a specific Jain Tantra, which has to be followed, you can use any sized Bhojpatra. They are not errors, but some black spots left over after drawing the Yantra, you can ingnore them. What is to be written in place of 'naam'? Write you name in place of the word Naam. Sir, I want to speak with you once... Can I get ur number plz??? ?